Macolline is a 25-acre native forest in a region of Northeastern Madagascar founded by Marie-Helene Kam Hyo. Founded in 2001, Macolline is open to receive tourists, students, and scientists. For an entertaining full day, the site features a walking trail, a pirogue (dugout canoe) ride through rice fields and rainforest and a brickyard and end the day with a delicious picnic facing the Indian Ocean. This area has experienced intensive degradation for over a century, and Macolline has been committed to the protection and reforestation of native Malagasy species in accordance with UNESCO’s conservation priorities. The maintenance of Macolline provides jobs for many villagers, so any money raised for Macolline helps to support (CALA) the Comité d’Aide aux Lépreux d’Antalaha (Leprosy Relief Committee of Antalaha). 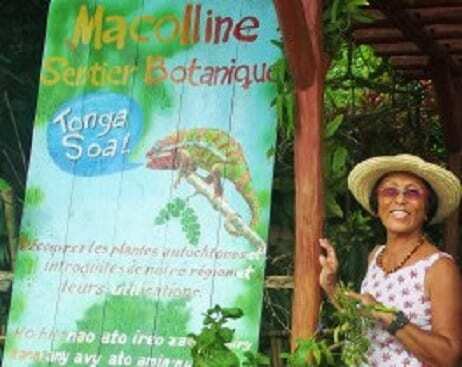 Macolline is a combination of natural preservation, protection, and enhancement of the Malagasy environment. The site includes a 10-hectare hill consisting of species of primary (original) forest, fruit trees, and commercial species. Along a river and facing the Indian Ocean, 3 km from the town of Antalaha, Macolline is an exceptional site for nature lovers, students, scientists, and botanists.